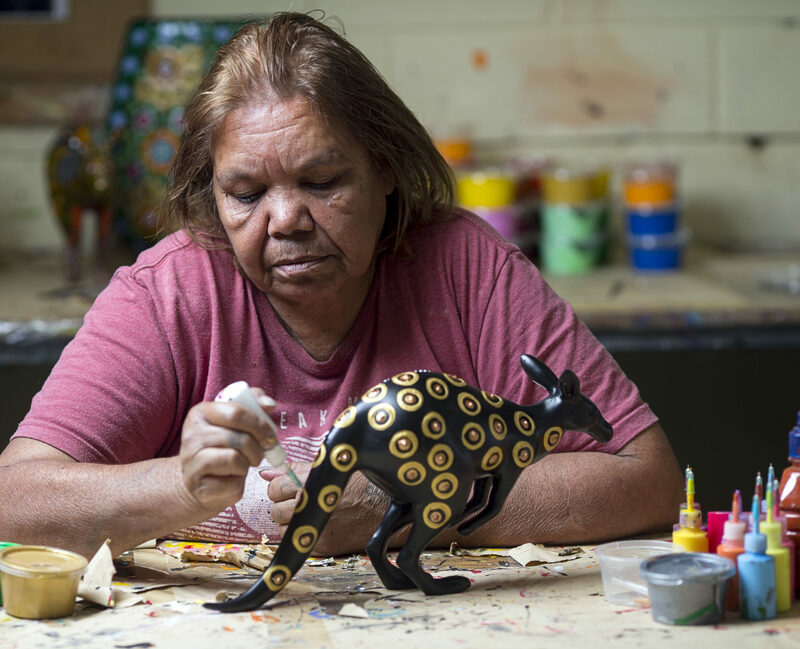 Keringke Arts is a working art studio environment close to Alice Springs famous for our bright and vibrant artworks. Keringke Art Centre is situated in the community of Ltyentye Apurte in the Central Australian region of the Northern Territory. The community was named for the stand of bloodwood trees that grow at the foot of hills to the west. Keringke Arts was named after an important and ancient rock-hole nearby that was formed when an ancestor Kangaroo travelled through the country. Several of the Keringke Artists have responsibilities associated with the Keringke Rockhole site. Keringke Art Centre began with a nine week fabric-painting course back in 1987. In 1988 the women of Santa Teresa held an exhibition in at Australian Bicentennial Craft Show, the first time an Aborginal group had done so. By 1989, ATSIC funding had allowed the building of a purpose-built Art Centre. It was named after the Dreaming place of Kathleen Wallace, one of the artists at Santa Teresa. Keringke means ‘Kangaroo Tracks’. It is Kangaroo Dreaming. The Centre quickly became an influential model for other art projects in the area, and in 1992 a cultural exchange program saw the group exhibiting in New Zealand. Despite widespread funding cuts to Art Centres during the 90’s, Keringke has flourished in recent times and is now a vital component of the area’s cultural, social and economic fabric. It was evident from the inception of the Keringke Arts association, that the Santa Teresa women certainly had an artistic style all their own. The women were instinctively drawn to work in bright colours, and their designs quickly became very fluid. According to Cait Wait, the women’s first co-ordinator, it was as though they had finally found an avenue for expression which filled a void in their lives, and they revelled in the opportunity. While the stories and imagery of this vast country has influence on the works produced by the Keringke artists, their works are not usually accompanied by any one story. Instead, age old motifs, landscape forms and patterns of movement lay the ground work for dynamic images formed from a personal expression of self within the modern world. Various artists have developed this style of painting at Keringke Arts over a twenty five year period. During that time three generations of artists have used pattern, colour, shape and design to create paintings representing their sense of country, culture and self. 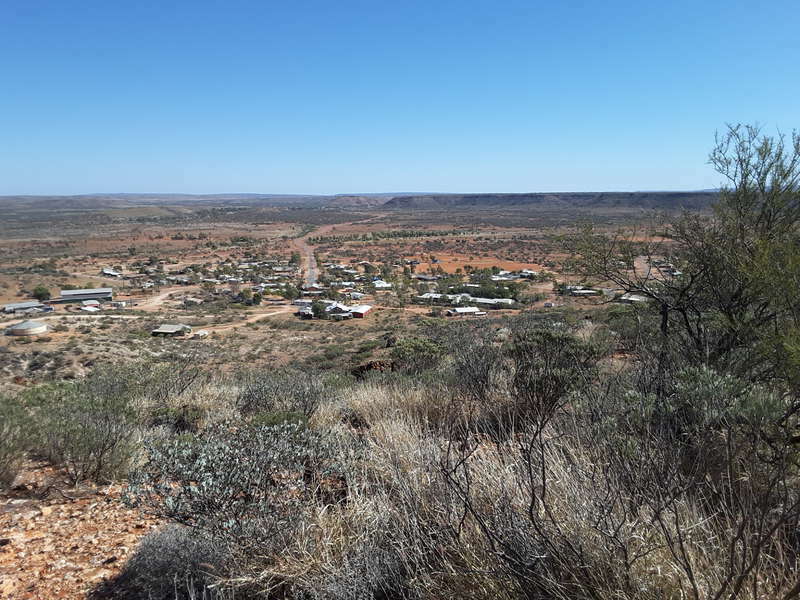 Eastern Arrernte identity connects a person through skin names, places and ancestral totems; as well as family names, language, and community. Personal ancestry is not necessarily expressed in the design of each work. Eastern Arrernte artistry has features common to ancient rock art and petroglyph designs found throughout Eastern Arrernte homelands. Some designs reflect sand stories or body paintings; but most commonly, in this contemporary form, the artistry is not attributed to any particular source, other than the artist. Santa Teresa is a small community of about five hundred people, located 80km south-east of Alice Springs. The country surrounding it is rich in rock art, artefacts and ceremonial sites. In Eastern Arrente, Santa Teresa is called Ltyentye Apurte, which means ‘stand of beefwood trees’. Santa Teresa is a community noted not only for its cohesion but also for the nature and variety of its support services and recreation facilities. This is story about the kangaroo that came in the dreamtime from the South East. It was a big red kangaroo (aherre), he went behind Santa Teresa (Ltyentye Apurte), along the creek (lhere). As he was going through the country he visited his cousin, the bellbird (kwepalepale). The place was really green, a smooth yellow vine (ayepe) was everywhere, ankle high. The kangaroo travelled along the creek, being careful so as not to get his feet caught in the vine. After he visited his cousin, he crossed a plain and got caught in the yellow vines, and his leg became tangled up. He was just about dragging himself up the gully, because it was a hot day, he could not go any further. He stopped in a clear area, but there were too many flies there. He used to get the dust and throw it over himself to keep them away. In doing so, he made a big hole and that became the rockhole. That was the last time he made footprints on the rock and they can still be seen today. After that, other kangaroos used to come down to drink at the rockhole, they were hill kangaroos, euros (arenge). To this day you can still see the tail tracks of the euros. There was a little pouch (apethe) near the rockhole, with two little shiny pink stones in it, representing baby kangaroos, there are only the remains today. The rockhole is now known as Keringke, a sacred site.